Clarion is a quirky open-world graphical roguelike with a semi-stoneage fantasy setting. The original alpha version of Clarion was being developed by one man using Game Maker. March 2012, Colin Sanders, the creator of Clarion, co-founded Perpetuo Studios LLC, and is currently rewriting the game in C++ (Allegro 5) as their first project. Graphics, sound, music, and an intuitive UI and controls make for an easy-to-play, but hard-to-master game. Large procedurally-generated world that's different each time you play. 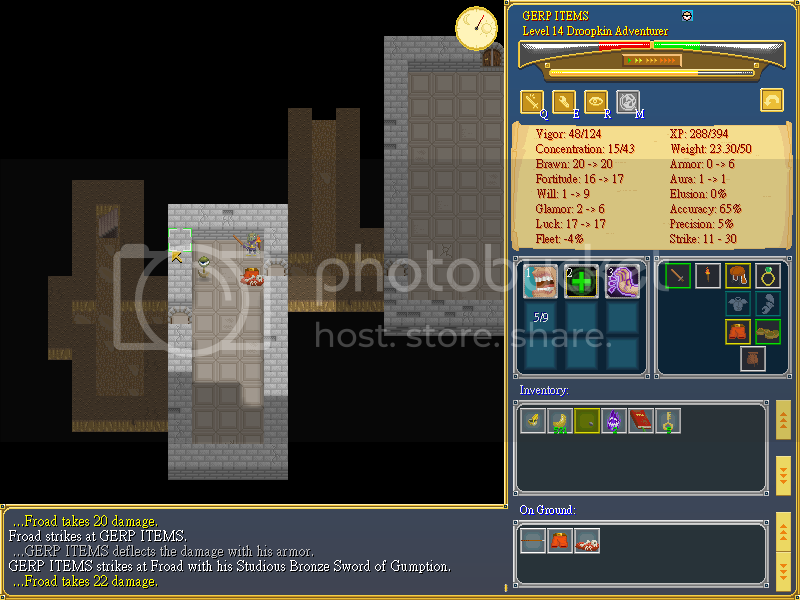 Towns, dungeons, and other points of interest are placed using an analyzing algorithm that ensures sensible progression and difficulty. Includes over 18 different surface biomes to explore, as well as a myriad of different town, dungeon, and cave generators. Grond, a strange new fantasy world. Meet dinosaur men, apes, and screaming wurms. Use rocks and cudgels as well as swords and spears to fight. Currency is edible. Magic sprites wander the world causing mischief. Uncover the creation myth behind the conflict as you play through the story dungeons. Unique combat mechanics. The concentration system gives players diminishing returns when using abilities too often. Getting a critical strike and missing at the same time causes a random botch event like a self-hit, an overexertion, a pratfall, and more. Every enemy in the game can potentially use the same abilities you can, and vice versa. Weapons and armor come with random modifiers and quality/rarity tiers. Play how you want. Change the world size, toggle permadeath, type in your own class, and more! This page was last modified on 9 April 2012, at 01:20.